first collection of parish material came from Shrule. Click image to download list of material. August's Archive of the Month feature from the RCB Library provides a potted history of the repository and highlights the very first collection of parish material that came into the RCB's custody in 1926. This early collection is from the Parish of Shule in County Longford and, together with additional materials transferred from the parish in the 1980s and 2010s, has been accessioned as parish collection or P.001. In the feature, Dr Miriam Moffitt brings a professional historian’s perspective on the content of this particular collection and the array of supporting resources also available in the RCB Library that shine a light on the story of this particular Church of Ireland parish, and its community. 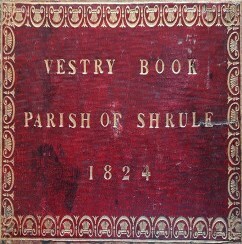 As well as focusing on the surviving content of the Shrule parish record collection itself, including baptismal, marriage and burial registers, the minutes of the vestry and select vestry meetings, preachers’ books, and sundry other materials, she supplements this with detail on the additional information available from such sources as diocesan visitations, magazines and the clerical succession lists, documenting the lives of individual clergy who served in a parish, as well as the rich and now searchable Church of Ireland Gazette which has been digitized and is available to 1936 inclusive here.